Originally the entrance led to a short descending passageway which was lined with red granite. This continued with a small ascending passageway which led to the main burial chamber. The burial chamber has a gabled roof which consists of several tiers of limestone layers. Only a small fragments of a sarcophagus was found when the badly damaged burial chamber was entered in the early 19th century. Original height: 48 m / 160 ft.
Base length: 78.5 m / 262 ft. Angle of inclination 50° 11' 40"
All of the pyramid complexes at Abusir are ruined, as much by stone thieves as from the ravages of time. 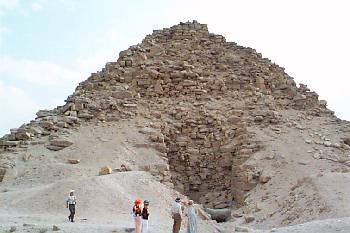 Sahure's complex, which he called "Sahure's soul shines", was probably the first pyramid built on the pyramid field at Abusir, and is significant both because of its construction materials and the king of decorative reliefs used within the complex. It was famous for its art in antiquity, and we today recognize the complex as another milestone of ancient Egyptian tomb architecture. The early Egyptologist Perring first investigated the pyramid, and shortly after him, Lepsius also examined the structure, but perhaps because the pyramid looked was so ruined, little attention was given to its excavation. Later, de Morgan reopened the entry corridor, but he too showed a lack of interest in further explorations. Then, in the 20th century, Ludwig Borchardt finally recognized the pyramid's significance. He wrote a two-volumed study that created a real interest within the Egyptology community. For many years, his work on the pyramid seemed complete, even though the pyramid was the subject of further studies. 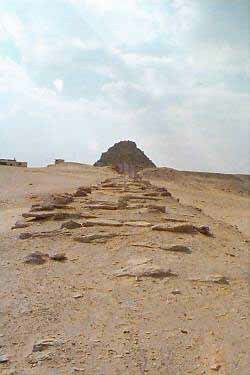 But in 1994 when it was decided to open the Abusir pyramid field to tourists, new discoveries were made. 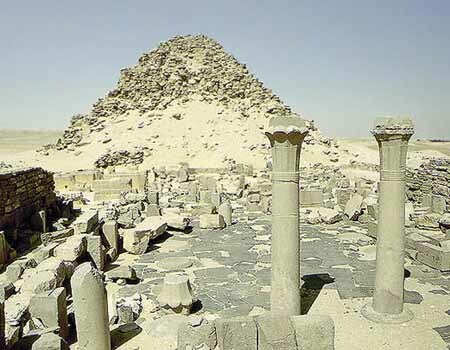 Several of the monuments at Abusir, and particularly the pyramid complex of Sahure, were the subjects of restoration efforts. 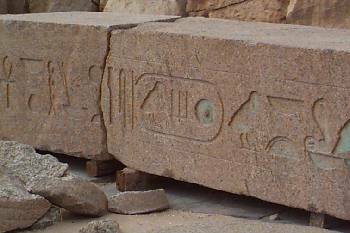 During this process, several huge blocks in the upper part of Sahure's causeway were discovered to be decorated with iconographically and artistically unique reliefs. They created a new understanding of the decorative program within the complex. The valley temple has a long axis oriented north-south with a southern and eastern ramp. Eight pink granite columns adorned the temples eastern entrance, while the temple's south portico only had four such columns. The valley temple had a basalt floor, decorated walls and an astronomical ceiling. Both entrances lead to a central room within the temple with walls that are also decorated with polychrome reliefs. The central room in turn leads to the causeway that then leads to the mortuary temple. The room also had a stairway to a roof terrace. The open courtyard contained 16 monolithic pink granite columns, each of which was shaped like the trunk and crown of a palm tree, atop a floor of irregular black basalt slabs. To the ancient Egyptians, these symbolized fertility and eternal life, and some Egyptologists believe that the open courtyard represented the sacred palm grove in Buto, Egypt's ancient "national cemetery". The columns were decorated with the names and title of Sahure, along with the goddess Nekhbet in the southern part of the courtyard, and the cobra goddess Wadjet in the northern half. At one time the columns supported an architrave bearing the royal titles, and on it rested limestone ceiling slabs decorated with stars. On the courtyard walls we find the scenes, though very fragmented, of Sahure's victory of the Asians and Libyans, along with the spoils of those battles. In the northwest corner of the courtyard once stood an alabaster altar with scenes depicting the symbols of Egyptian unification (between northern and southern Egypt), along with scenes of offerings made to Sahure. A corridor encircles the courtyard, and on its walls are scenes of Sahure fishing and hunting birds and other desert game. There is also a significant scene of the royal entourage and under the depiction of Neferirkare, we find text that was added, stating, "Neferirkare, King of Upper and Lower Egypt". 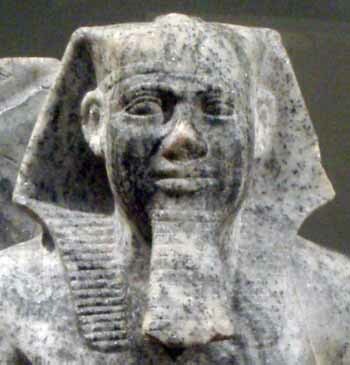 This is one reason many Egyptologists feel that Neferirkare rather then Shepseskare Ini succeeded Sahure. This courtyard served more then the cult of Sahure. A thousand years later, it also served the cult of Sekhmet, probably because of a fine relief sculpture of the lion goddess. Her consort was Ptah, and together they were the principle gods of nearby Memphis. Later still, the early Christians in Egypt also founded achurch in this courtyard. A path from the rear of the chapel leads to the Offering Hall. This was probably the most important room in the temple to the King's cult. This room too has an alabaster floor with an astronomical ceiling decorated with stars. Here, the walls are decorated with scenes depicting divinities carrying offerings for the dead king. This room sits adjacent to the East wall of the pyramid and there is an enormous, granite false door on the rooms west wall. The door should have had inscriptions of magical spells, and the names and titles of Sahure, but it does not. This has led some Egyptologists to believe that it was once covered in either copper or gold that was inscribed with this information. 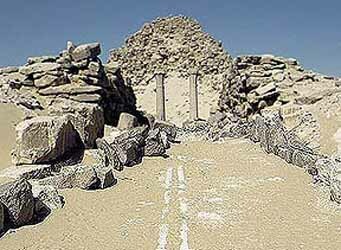 The ancient Egyptians believed that the spirit of the dead king would come here through the false door for his meals. Food offerings stood ready for him on a stone alter. Annexes adjoin the Offering Hall and were probably used for storage and other functions connected to the hall. Some of these rooms were plumbed with copper pipe, with drainage to a central canal paved over with limestone. In fact,there was some 180 meters of pipe running through the temple. Another section of the annex was designated as a treasure chamber, where ritual objects used by the cult priests were stored. Parts of the southern section of annexes include two storied storage chambers.